I have a few extra Stampin' Up! Holiday Mini Catalogs that I would be willing to mail to "new" customers. Is there anyone interested? It has to be the BEST mini catalog I've seen. 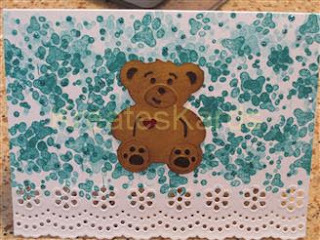 So many wonderful products including exclusive stamps, dies, & paper from Build A Bear Workshop. Mini catalog is valid as of tomorrow (9/1 thru 1/4/2010). 1. You live in the US, we can't mail these outside the US. 2. You don't already have a Stampin' Up! demonstrator, and would like me to be your demonstrator. I promise no high pressure sale tactics (not my style at all). 3. You will need to provide me with your name, mailing address with zip, and e-mail address so I can add you to my monthly mailing list. Do not post your personal information in the comment section. Please e-mail me directly using "Catalog Request" in the subject line. There is a link at the top of my blog for e-mail. 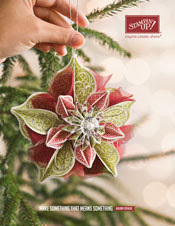 Tomorrow (Tuesday, September 1st) is the first day you can order from our new Holiday Mini Catalog. There are so many wonderful, new products that I know you are going to just LOVE. I have a BIG Surprise that I will post tomorrow night that will pertain to orders placed in September and October directly thru me or thru my website. Complete details will be revealed then. Paper Piercing - What fun!!! Today I would like to give a bit of a review on the Stampin' Up! 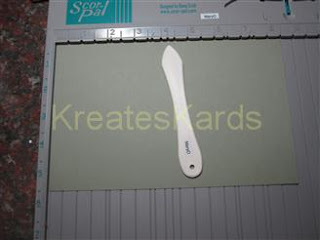 Paper Piercing Tool (item #116631) and the Mat Pack (item #105826). 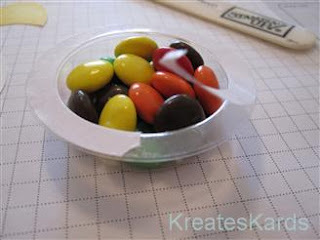 Paper-Piercing Tool .... Use the paper-piercing tool to embellish any crafting project. 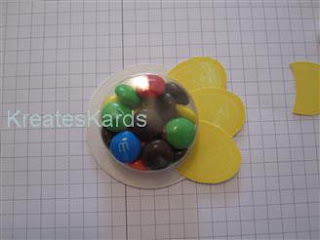 Comes wtih reusable storage tube and protective cap. Handle length is 3 1/2", length of piercing tip is 3/4". I went to Michaels today and also picked up some templates. 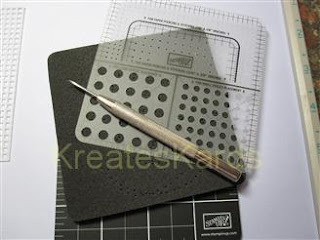 These are actually suppose to be for yarn stitching (also known as Plastic Canvas), but the work great as paper piercing templates too. 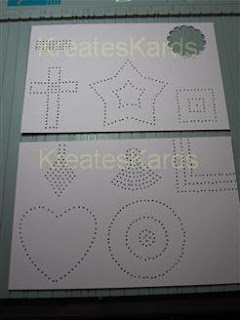 The templates came in packs of 10 for $1.29 to $1.99. They are back by the yarn. I got a 4" square, 3" circle, cross, heart and star. The Stampin' Up! template works well too. Lots of tiny hole areas (perfect for our Paper Piercing Tool) to do a few or a lot of accents to your design. I used the Stampin' Up! setting mat (this is hard) and the paper-piercing pad (this is a firm foam consistency) will ALL of the templates. 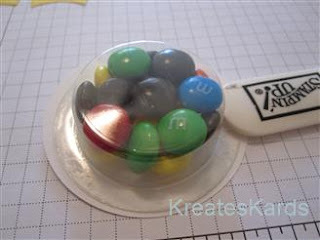 They help protect your work surace and help prevent the paper piercing tool from going thru to the table top. The above photo just shows a few of the designs I made using the templates. Wouldn't they be a great addition to any card. 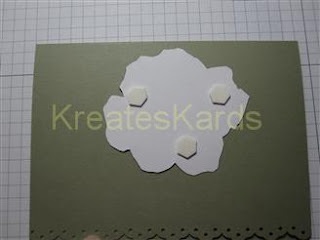 You can also accent any paper punched area with Paper Piercing for an added piece of interest. 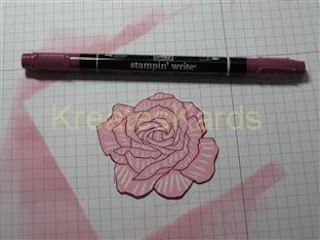 I have another Paper Piercing Tool, but have found Stampin' Up! 's to be far superior. It is heavier, has a bit thicker point than the other one I have. You can do fine dots or holes all the way thru the paper depending on the amount of pressure you use. 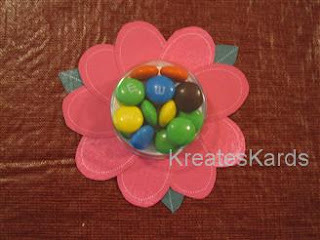 With the help of the template, you can do straight lines, curved areas etc., so easily. If you buy the Paper-Piercing Tool, definitely buy the Mat Pack too. They really are meant to work together. Then if you want to be a bit more creative, get the additional templates in other shapes. The Paper Piercing Tool and the Mat Pack Template work great too for placing brads. Line up the card/item where you want, then pierce while on the pad and setting mat. Remove from pad and mat, and set brad. The hole will be the perfect size and in the perfect spot because of using the template. 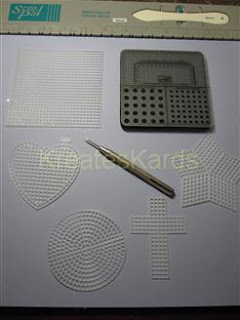 The Paper Piercing Tool and the Mat Pack set are must haves in my opinion for any crafter. The items may be purchased from my on-line Stampin' Up! store or by contacting me directly. Today's tutorial is "Crayon Resist". You use a white crayon on glossy paper to resist ink when you brayer or sponge over the stamped image. So many unique accents can be done with this technique. Using Rich Razzleberry Classic Ink, stamp the largest flower from the Fifth Avenue Floral Stamp Set onto the glossy piece of card stock. I stamped my image more to the left, but you can put it anywhere on the piece of card stock as you will be cutting it out later. Using a white crayon, mark lines or fill in areas that you do not want the ink to adhere to when you brayer or sponge the image. After you have done the crayon, ink your brayer with Pretty in Pink Classic Ink. You will start the brayer off the card and roll over. Re-ink your brayer as needed. Roll over the rose going all different directions. I left the right side of the glossy paper plain (no ink) so that I could pick it up when finished. Notice how the white crayon marks show thru. That is the crayon resist. Pick up the glossy paper by a spot with no ink on it and move back and forth to dry. It takes just a bit because fo the glossy card stock. Once dry, take a paper towel or kleenex and gently wipe over the rose. This will pick up any residue ink and make the white spots/lines show even better. Using very sharp paper snips (scissors), cut out the image. Try to keep as much of the outline as possible. 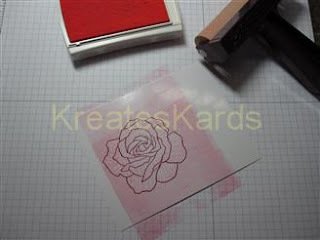 Using the Rich Razzleberry In Color Stampin' Marker, ink the edge of the rose to bring back any cut off outline. You can also do this with a sponge and ink from the Rich Razzleberry Stamp Pad which will give a more brushed look to the outline. Set aside to dry. Taking your piece of Mellow Moss card stock, score at the 4 1/4" mark. Fold in half, making a crisp crease/fold with your bone folder. Using the eyelet border punch, create a beautiful and elegant border on the Mellow Moss card base. Put dimensional on the back of the rose. 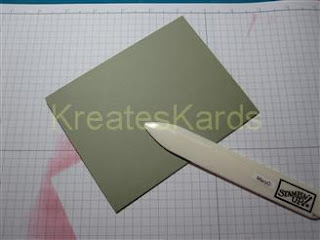 Remove protective coating and place on card front. Here's your finished card. You could add in a sentiment if you would like or leave it just as is. 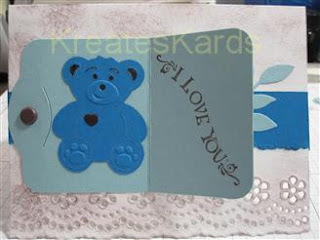 A perfect card for any occasion and sooooo easy to make. Stampin' Up! has a page of single stamps in our catalog on Pg 208. 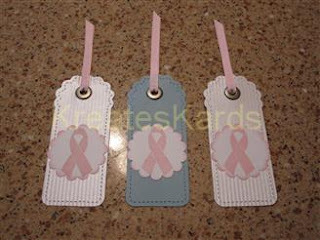 The Ribbon of Hope Stamp (item #115552) is one of these stamps that can be purchased individually. 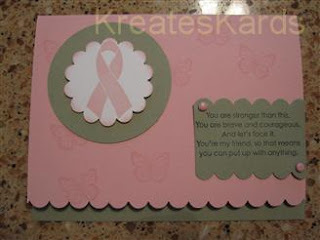 I created a couple of cards yesterday using it as a Pink Ribbon for Breast Cancer Awareness. Very pleased with the results and thought I would showcase them here for you. You are stronger than this. you can put up with anything. 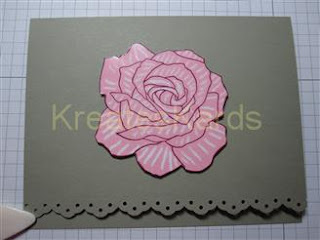 I sponged the edges of the scalloped circle and the edges of the white card using Petty In Pink Classic Ink. Just a few more things to give you inspiration. I won't go into a great deal of detail on these as much was explained in my last two blog posts. I'm just having lots of fun making bookmarks and cards and wanted to share. There are single stamps on Pg 208 of the main Stampin' Up! catalog. Ribbon of Hope (item #115552) is one of many. I used leftover paper I had for the bookmarks. 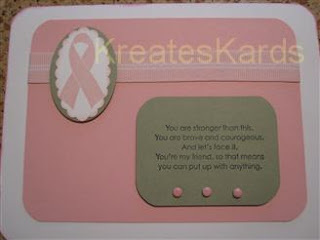 The ribbons and classic ink used was Pretty in Pink. I loved the look of the background on the above two cards. 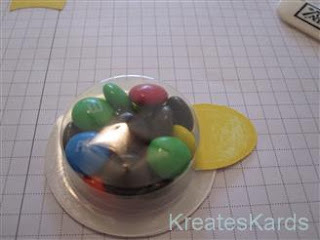 Can you guess what I used to create it???? It was the P is for Paw Stampin' Round wheel (item #115620). I run it over and over the card to achieve the effect. First card was done using Bermuda Bay Classic Ink and the second was done using Chocolate Chip Classic Ink. 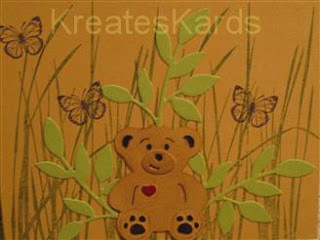 I made a quilted look of the background using my Scor-Pal (scoring every 1/2") and Stickles. 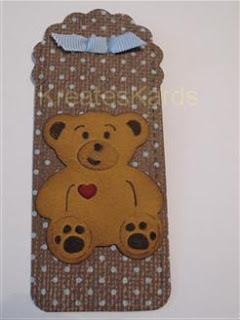 The Bear is sitting on a bookmark/tag. Thought it looked great as an accent to the card. 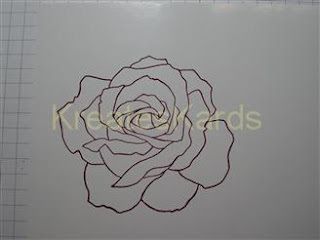 The flower was printed on some card stock and I cut it out and attached with dimensionals. 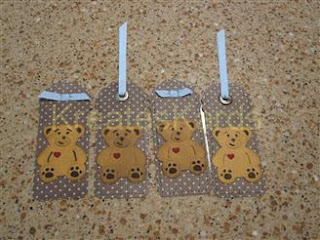 More little bear bookmarks. Thought they would make great stocking stuffers, thank you gifts, and I might even keep a couple for myself to use. Just remember with bookmarks that you don't want to add anything that would add lots of depth to the bookmark as it could mark the pages of the book. Also chalk and glitter can rub off, so would suggest you NOT use them on a bookmark either. 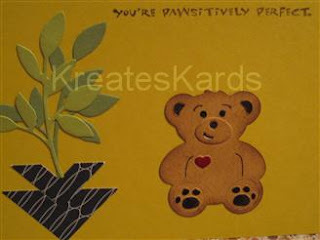 Bear was made using More Mustard Card stock that was sponged with Chocolate Chip Classic Ink. I also used Stampin' Markers in Chocolate Chip and Real Red for the accents. 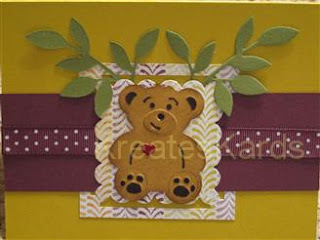 Scallop Edge Border Punch was used to create the backdrop for the bear (Lil Paws). Rich Razzleberry cardstock and 1/2" Polka-Dot Ribbon (item #115613) was used to accent this. Card base is Crushed Curry. Backdrop for the Lil Paws is Razzleberry Lemonade (#115675). See bookmarks for how Lil Paws was created. Leaves were made using Old Olive card stock and the Stampin' Up! Little Leaves Sizzlit Die (item #114511) for the Big Shot. Butterfly was stamped using a Stampin' Up! incentive stamp. Leaves were made using Old Olive card stock and Stampin' Up! Little Leave Sizzlet Die (item #114511). 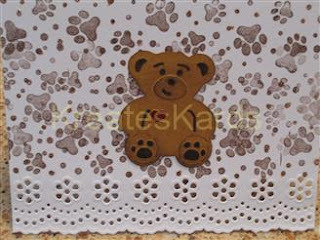 Sentiment is from Beary Nice Wishes (item #118050) available September 1st. This is one of the ready made cards that said Thank you in the middle. My cute little Stampin' Up! is covering that up to help me recreate the card into something completely different. 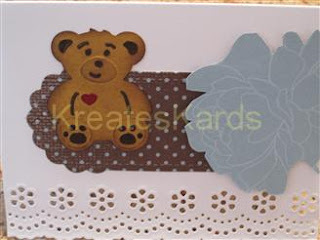 The fancy eyelet border was already on the card. 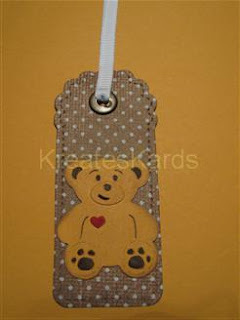 September 1st you will be able to purchase this cute little bear that is embossed and cut out with the Big Shot. It is part of the Build-A-Bear Workshop collection and is an Embosslit called Lil' Paws (item #117984) and the sentiment is also from that collection and is called Beary Nice Wishes (item #118050). 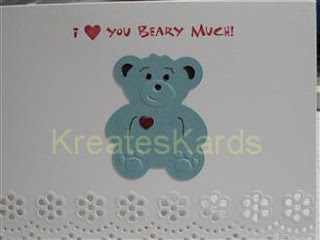 I (HEART) YOU BEARY MUCH! HOPE YOU'RE BETTER BEARY SOON. Isn't it a great set and will be able to use for so many projects and cards. Another recreated card. I took chocolate chip classic ink and sponge over the complete card. The deeper blue stripe has a torn/ripped edge which was achieved using The Tearing Edge Ruler (item #102930). The little card was made using Stampin' Up! Two Tags die (item #115954) for the Big Shot and the Stampin' Up! Little Leaves Sizzlit die for the leaves. The seal in the middle is from the Build-A-Bear Collection stamp set called Seal of Pawthenticity (item #118054). 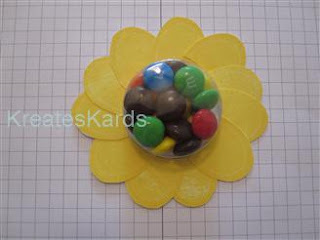 I attached the little card using a 5/16" Neutral Brad (#112534) in chocolate chip. The slit in the card and the natural crease (because of the die) allows the card to be easily folded. I took our Stampin' Up! Lil' Paws (item 117984) and glue him inside with SNAIL Adhesive. Using the Stampin' Write Markers I colored in the eyes, ears, nose, eyebrows and heart. The I love you stamp is not Stampin' Up!. I thought this was great to have a card within a card. The Medallion stamp (item #115223) was used as the center image of this card. The medallion covers part of the front and part of the back of the card. I used my brayer to ink the stamp, then set the paper onto of the stamp and ran my fingers over the paper. The little butterfly is an Stampin' Up! incentive stamp (one of my favorites) and the sentiment is from Ever After (item #113401). I use Pale Plum card stock and Perfect Plum & Old Olive classic ink. We are having some repair work done at the house plus company here for a few days, so I haven't had the chance to do additional tutorials for you this week. Hope these cards helps inspire you. I was very touched to receive this comment on my blog today with regards to "Cards for Soldiers". Our service men and women do so much to help protect us and our freedoms, and I have been honored to help make cards for them to send home to their families and friends. The following is being posted with permission from Courtney. Hello - I came across your website while searching for inspirational quotes. I am a Family Readiness Group Leader for the 502nd MRBC Engineer Company from Ft Knox, KY. Our Soldiers, inlcuding my husband, are deploying very very very soon. I looked around your site and found your challenge for cards for the Soldiers to mail home. I just wanted to let you know what an amazing gift you are providing to our nations troops. It is so refreshing to see the wonderful things people come up with to support our Soldiers serving overseas and their families back home. Thank you very much. Think how much even one card could mean to one of our soldiers and to his family who receives it. THIS APPLIES TO CUSTOMERS IN THE STATE OF TEXAS (ORDER MUST BE SHIPPED TO TEXAS ALSO) Only the items listed below are tax free. The state of Texas is having a sales tax holiday from August 21 - 23. Because school supply items are included in this sales tax holiday, the below list of items will be tax free during the holiday period. Please note that you must place your order with Stampin' Up! during the tax holiday period in order to receive these items tax free. THIS APPLIES TO CUSTOMERS IN THE STATE OF TEXAS (ORDER MUST BE SHIPPED TO TEXAS ALSO). Orders may be placed on-line thru my website or by contacting me directly. Only the items listed above will be tax free during this tax free weekend. You can make a difference, with the simple things you do. How about making a difference in the lives of the soldiers who protect you every single day by SERVING you. Make some cards and see if it doesn't make you feel good just doing something special for others! WE NEED YOU AT CARDS FOR SOLDIERS! Please sign up today!!!! I needed to make a "Get Well" card today. Thought I would show you the two that I created. I used Whisper White card stock for the base. And my favorite "Tall Tales" Designer Series Paper for the animal insert. 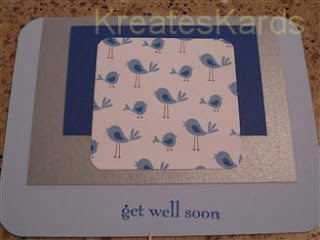 Get Well Soon is from the Garden Greetings Stamp Set and I punched it out with the Modern Label Punch. I sponged the white border and edges with Chocolate Chip Classic ink. 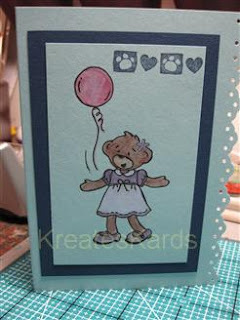 The paw prints are from the "NEW" set from the Stampin' Up! Build a Bear set (available 1 Sep) called "Seal of Pawthenticity. 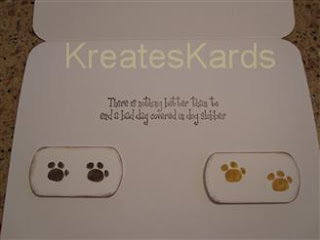 I stamped the paw prints and greeting with Chocolate Chip classic ink and one set of paw prints with More Mustard. I punched out the paw prints using the Key Tag Punch (retired) and sponged the edge with chocolate chip classic ink. 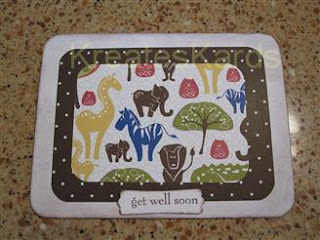 This card is for a veterinarian, so hope this will be perfect. It is going to be signed by two of his doggie patients. This is another card I made, more simple. Shades of blue and brushed silver paper from Stampin' Up!. Using scraps that I had here. 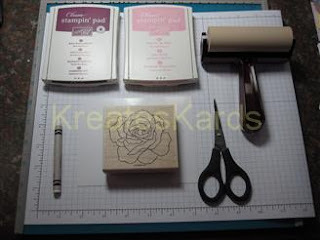 Sneak Peak III - Holiday Mini Catalog - Stampin' Up! 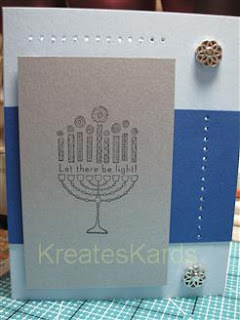 This is a single stamp that will be available for Chanukah. It is called Let There Be Light. I made the card using Bashful Blue as the base, Brilliant Blue as an Accent, and I used Classic Black ink for the stamped image on the Brushed Silver Paper (Item #100712 in main catalog). If you like the silver Designer Brads, they are Item #112577 Filagree. 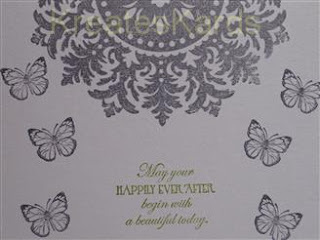 I used my Paper Piercing Tool (Item #116631) to create the accents on the top and side of the card. 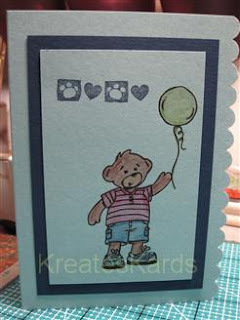 I showed these images from "Beary Best Friends" stamp set the other day but hadn't made them into a card at the time. 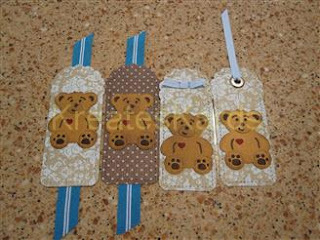 I used both of our border punches ... the Scallop one for the boy bear and the Eyelet one for the girl bear. I really like these stamps. 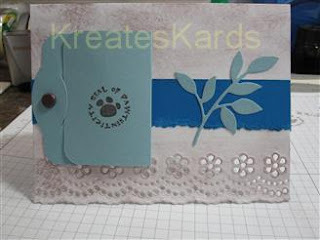 The heart and paw prints stamp is from "Seal of Pawthenticity" set which has a bear heard, a seal of pawthenticity, the paws & hearts, and a "created by:". The images were done using the Watercolor Wonder Crayons (see Pg 154 of the main catalog). WOW - Look At these Numbers!!!! I'm so excited. My blog was started in March of 2009, just 5 short months ago. I was looking over my blog tonight and realized that I now have 99 people who are following my blog publicly!!!! Then I looked at the counter at the bottom of my blog and saw that I was at 24,966 hits !!!!! Oh my gosh, that is almost 25,000 hits in 5 months. I can't thank you all enough for all of your support and for coming back to my blog so often. You are all the reason that I keep this blog going. I love spreading the word about Stampin' Up! and about card making. 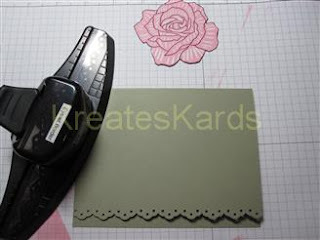 This tutorial is for the new stamp set called Sweet Centers that will be available from Stampin' Up! as of September 1st 2009 in our "Holiday Mini Catalog". The catalog is valid from September 1, 2009 thru January 4, 2010. 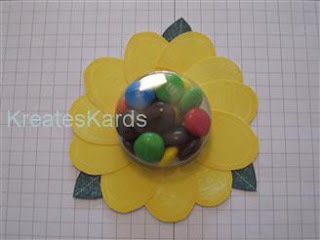 It has some amazing products in it, and one of my personal favorites is the Sweet Centers stamp set that has designs for this flower, a hot air balloon, an ornament, Halloween Treat, Valentine's Treat. 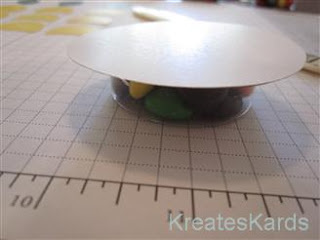 This tutorial is to explain how to use the "sweet center" cups that Stampin' Up! is also selling in this catalog. 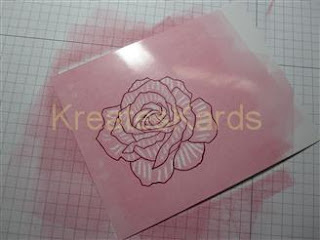 This is one of the flowers I made with this stamp set. 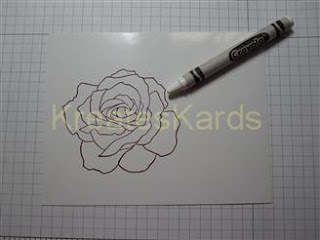 You stamp on Whisper White paper and the flower and leaves are the color you are stamping with. I used Summer Sun for petals and Handsome Hunter for leaves. 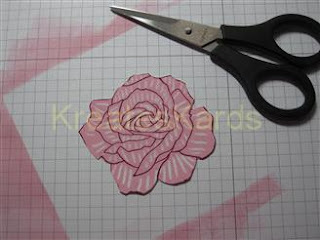 Stamp out 9 petals (or more, up to you) and when dry cut out with your scissors. 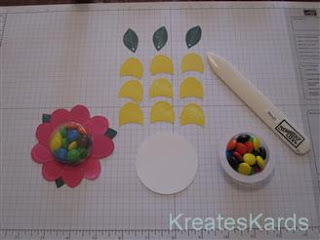 Stamp out 3 large leaves and when dry cut out with your scissors. 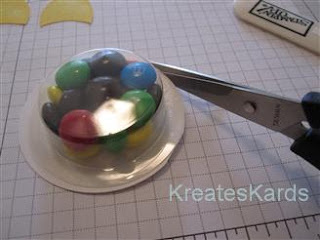 Fill a sweet treat cup with 1 tablespoon (approximately 1/3 of a regular size bag) of M&Ms. Make sure your candy is level or below the rim. Gently remove the protective strip on the edge, which will reveal the adhesive. Cut out a 2 inch circle (I used whisper white, but any color is OK). Set on top of adhesive, center as much as possible. Press around the edge to adhere. Use the bone folder and go around the edge, getting out all of the air bubbles (if any) and to make the seal extra secure. Trim the paper that is on the outer edge of the cup rim, making it all even. 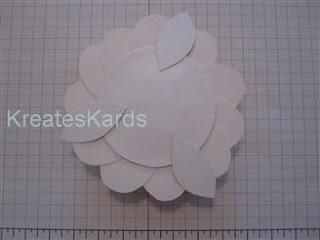 Use a liquid glue (like our Tombo Mono Multi glue) to adhere the petals to the rim. Put glue on the underside just on the curved part that will touch the rim. Be careful not to use too much as it will spread. Put the petal on the rim ... the curve of it that you cut (part of the pattern of the stamp) is a perfect fit around the cup. Repeat the above process, overlapping the petals as you add them in. My flowers were done with 9 to 11 petals ... there is no right or wrong to the number. Turn upside down and attach the large green leaves. I used 3 and set them so they would peak out behind the petals. I used SNAIL adhesive on the bottom area of the top side of the leave. Place, attach, and press to secure the leaves. Here's how it will look with the leaves attached. 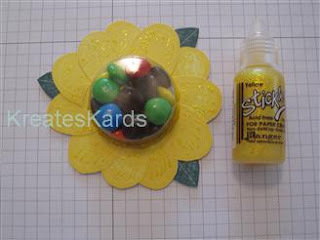 I dabbed bits of yellow stickles (glitter glue) on the petals. I like the sparkles it added. 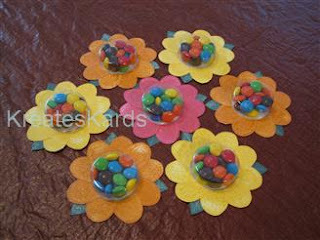 Here's the 9 flowers I made. Thought they would make a great centerpiece for my workshop on Saturday. The pink one is Melon Mambo with Diamond Stickles. The orange is Pumpkin Pie with Orange Stickles on it. If you have any questions, please ask. If you would like to place an order, you may either contact me OR shop on-line thru my Stampin' Up! website (see clickable button at top of this blog). 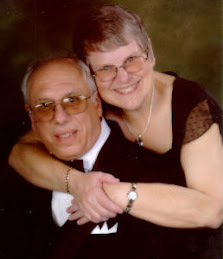 Thank you for stopping by and looking at my blog. Please leave a comment too. 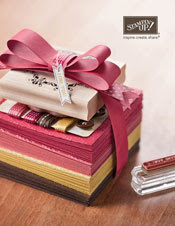 Sneak Peaks - Holiday Mini Catalog - Stampin' Up! Cards, Cards ... Everywhere !!!! Just for Kids Promotion - Stampin' Up!